With the kitchen being one of the most used rooms in a home, there are a number of opportunities to turn it into a more efficient, productive, or fun place to be. Outfitting your kitchen can seem like a daunting task, but with the right equipment you’ll enjoy the process, and even more importantly, enjoy preparing and cooking food! There is no shortage of machines, equipment, gadgets, and novelties available for the home chec, from the essential to the inspiring and humorous. It can be tedious to cut bananas up into slices, particularly if you’re looking to slice up more than one. 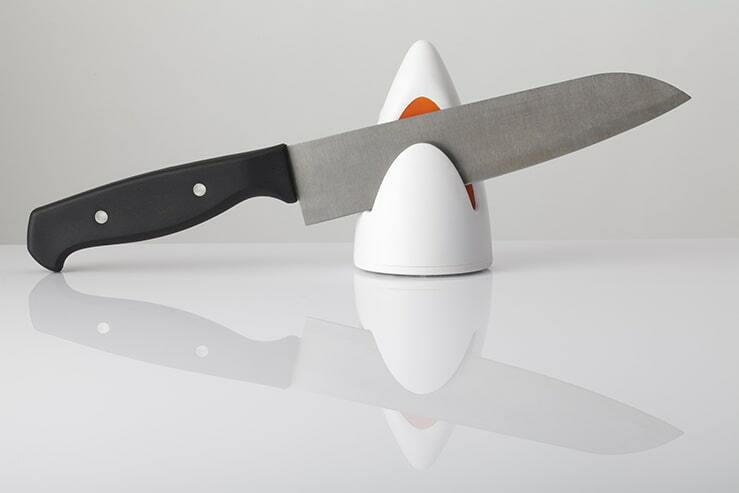 This slicer allows you to create perfect, geometric slices in one move! Eggs can be boring but there’s no debating their nutritional value. If you want to inject some fun back into eggs, particularly for the kids, these egg moulds are the perfect solution, and make cooking a breeze too. Pineapple is one of the tastiest but most difficult fruits to prepare. The prickly skin makes it difficult to handle, and getting the best out of it requires plenty of knife work and cutting. This pineapple corer not only allows you to de-core the fruit in one motion, but it also has an integrated slicer to make perfect serving slices just one step away. Lemon can be a pain to juice, and it also presents a risk of spraying. With this gadget, it’s simply a matter of sticking it into the lemon and spraying a mist of citrus over your dish. Garlic is a crucial ingredient in many tasty dishes, but peeling it can be tricky, and the smell of garlic is difficult to remove from your fingers. This gadget perfectly peels your garlic with a simple rolling motion. Herbs are at their best when finely chopped, but this can require some professional knife work, not to mention time and energy. These scissors are intelligently designed to do all that chopping for you. Eggs are a staple food in many households, but whether you’re baking a cake or making an omelette, cracking the eggs can be messy and result in shells in your meal. This simple device keeps your hands clean of egg and perfectly cracks it into your bowl. When cooking meat, any good chef knows that temperature is key. They also know that efficiency is important in the kitchen. This two-in-one device allows you to measure the temperature of your meat while turning it or moving it in the pan. Another two-in-one device that brings great efficiency to serving pizza, this gadget lets you cut with precision and serve each slice immediately. There’s never been an easier way to extract fresh herbs. Simply shake a few times and the rest is history. While salads may be healthy, their dressings can be full of calories. Sometimes the simplest dressing is the tastiest and healthiest. This clever device allows you to add oil and herbs to the chamber and simply spray a mist over your salad for taste. Mashed potato is a favourite dish amongst households all over the world. Making a perfect mash, however, can be a struggle, and developing that creamy consistency is key. This potato masher uses a rotating motion to make the mashing process easier and faster. The kitchen is where the family is fed, and for this reason hygiene is of the utmost importance. Regular handwashing is vital to good family hygiene, and hands free soaping is an even better defence against bacteria buildup, not to mention extremely convenient! Fill this soap pump with your favourite hand soap and enjoy sensorised soaping. Washing and drying salad leaves is important for taste and hygiene, but it can take a long time. Waste less paper towels and save time by using this spinner to dry your lettuce leaves using a centrifugal motion. Sometimes the simplest gadgets are the most useful. When cooking it can be hard to find a place to rest utensils without making a mess or contaminating them. This simple spoon rest solves this problem once and for all. From a practical perspective, no modern kitchen would be complete with a mixing bowl. This stand mixer is contemporary in design but also a necessity for the keen baker. Cooking rice need not be the stovetop tedious process it used to be. Digital rice cookers can do all the hard work for you; simply set and forget! Don’t be worried if you put the rice on too early, either, as this one will keep it warm long after it’s been turned off. There are plenty of two-in-one kitchen tools, but this four-in-one avocado tool takes it to a new level. Save time and space when cutting and preparing avocado. Not all of us are natural born cooks, and even if we were, it never hurts to follow a recipe. Keep your recipes front of mind and safe from splashes with this smart holder. While most peelers are easy enough to use, this one is not only ergonomic but also significantly faster and easier to use. It sits nicely within your palm for carefree peeling. Say goodbye to corn in your teeth and save time when preparing kernels for salads and meals. This inventive gadget allows you to strip the kernels in one swift movement, collecting them for you to use later. For a bit of fun in your soup pot, this ladle emulates the lochness monster. The kids will love it and it may even make a simple soup more fun to serve and eat. Entertain the family with this functional yet fun pot lid. Cover your steaming pots and watch the ferry emit steam as your meal cooks. Tea is a welcome solace after a busy day, and this infuser makes it all the more entertaining. The animated character relaxes in your mug as if he’s in a hot spa, while your loose leaf tea infuses. We all know that sharks have sharp teeth, but did you know that you can sharpen your kitchen knives on them now? This decorative and interesting gadget will have guests commenting and complimenting you every time. As such an important room in any household, the kitchen can be transformed by simply stocking it with useful gadgets to save time and energy. It can also be injected with some fun with many of the novelty yet still functional gadgets out there. Consider outfitting your kitchen with any of these gadgets and your whole family will love it.